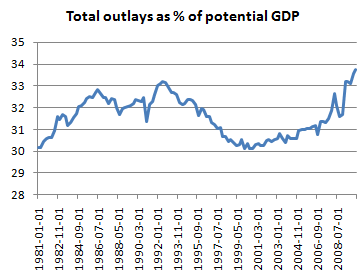 So what do the numbers look like when you look at total government spending as a percentage of potential GDP? What’s going on here? Basically, the Obama stimulus didn’t contain a lot of public works — and those works, such as they are, have only partially come on line. Meanwhile, aid to state and local governments wasn’t enough to prevent substantial cuts. 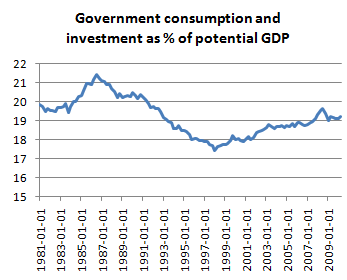 So by this measure, government spending has gone nowhere. The bottom line is that notions of a vastly expnading government are highly overblown.